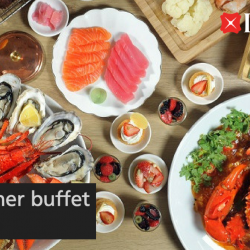 Now exclusively for DBS/POSB Debit or Credit Cardholders, enjoy 1-for-1 dinner buffet from now till 31 March 2018. 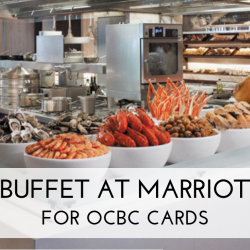 Indulge in the freshest International buffet spread at Marriott Cafe, where their chefs take centre-stage to whip up a perfect culinary storm for you. Find the freshest selection of oysters, snow crabs, crayfish and prawns at the Seafood Station, before indulging in some piping hot noodles cooked à la minute. 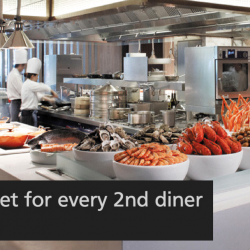 Savour renowned local dishes such as the Singapore Chilli Crab, Chicken Rice or visit the hot buffet line for an extensive array of premium meat dishes such as Crispy Pork Saddle with Pancetta Prune and Mixed Herbs, Slow Roasted Prime Rib and other roasted delights cooked to perfection at the Beech Oven Station. For those with a sweet tooth, the signature desserts include the Sticky Date Pudding that will make for pure palate pleasers after a satisfying meal. Now exclusively for DBS/POSB Debit or Credit Cardholders, enjoy $2++ lunch/dinner buffet for every 2nd diner from now till 31 January 2018. 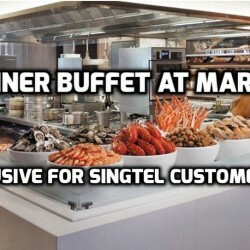 For Singtel customers only from now until 31 August 2015, you can enjoy 1-for-1 Dinner Buffet at Marriott Cafe, Singapore Marriott Tang Plaza Hotel. There’s limited tables for this promotion, so make your reservations now! You can indulge in the freshest International buffet spread at Marriott Cafe, where our chefs take centre-stage to whip up a perfect culinary storm for you à la minute upon request, bringing the “Freshness Redefined” concept to life.